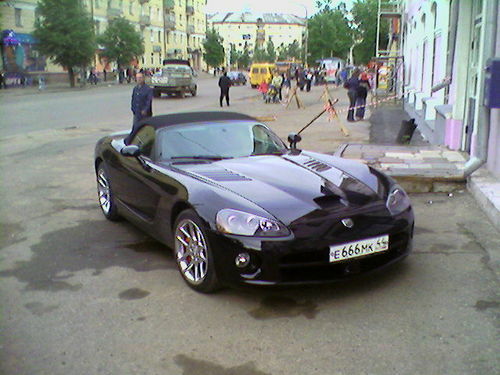 This was a Dodge Viper in Russian city Kostroma. And it carried plates with “666” number. Some may not liked it too much considering it to be devil’s breed. 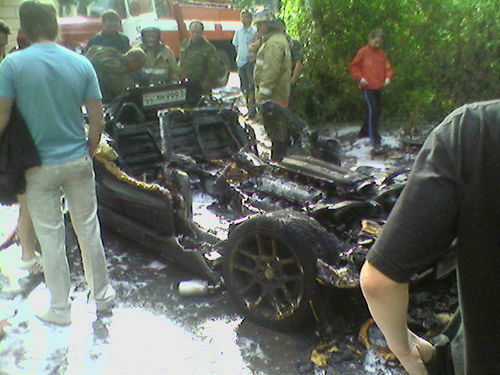 He had an accident or someone set it on fire or what? We need to know it! Tell us please! He was infidel! Death to all non-muslims! 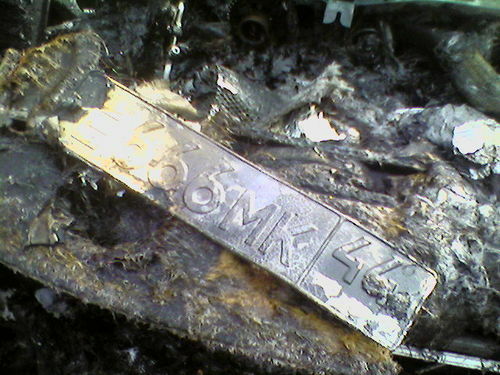 why did it burn? Is archaic russian fire department too slow? the car was probably stolen from the west anyways. That would be anti-russian, not anti-american, but I get your point, the west hates Russia. 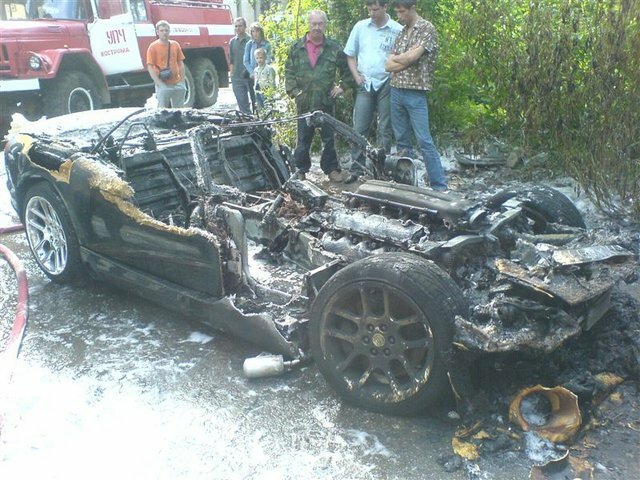 Where are the roads good enough in Russia to drive such nice cars? Sport cars are powerful, but also delicate and low to the ground. Only the cities. Even Toyota’s can barely handle dirt village roads due to the low clearance compared to Niva’s, etc. And that’s why there are so many offroaders in Russia. Have you also notised how popular Hummers are geting among Moscovites? About two years ago I didn’t see any Hummers in Mosocow, now you can see one on every street corner. I wonder if they are going to replace BMW 7 series as the car of choice for the young city slickers of Mosocow and St. Petersburg? 666 in chinese culture is good luck isn’t it? Three of the same numeric symbols appearing in a row is mearly a side effect of the base of the numeric system being used. In this case, it’s the decimal system. When you look at a number such as 666 in using an octal or binary or hexadecimal base, the pattern disappears. 666 decimal = 29A Hex, 1232 octal, 101001101 binary. They all have the same value. There’s no point in converting it to binary – it’d still stay an evil number, even in its new form. P.S I wish atheist people were less hateful about religion. Religion doesn’t corrupt the world, hate does. P.S.S And no, I am not religious. If any, I am agnostic. What makes you think I’m religious? Because I know what 666 means…. well excuse me for having a brain, I must be a bible thumper then. What does U.P.Ch. stands for on the fire truck. 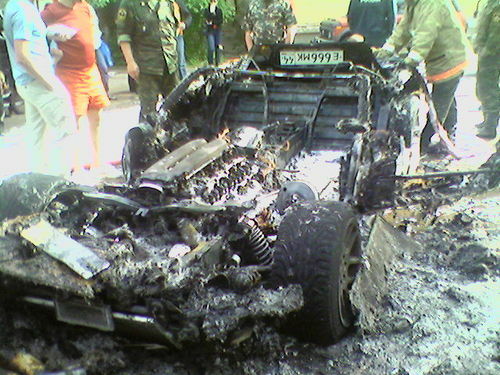 If thats what i think it is: uchebnaya pozharnaya chast, that would explain why the car had burned out completly. Anyone? And can anyone please explain to me why tires have not burned out? Anyone notice that the tires withstood the heat that destroyed the fiberglass, or are we still trying to prove how intelligent that we are? Doug. It looks like the source of the fire was above tire level, possibly engine compartment. Rising flames would take out everything above, gradually moving down to consume combustible material candle-fashion. The heat would be pretty intense of course, but it takes a lot to actually melt a tire. If the fire had been allowed to continue flame would have caught the hot rubber, very quickly destroying everything above tarmac. The fire department got there first. 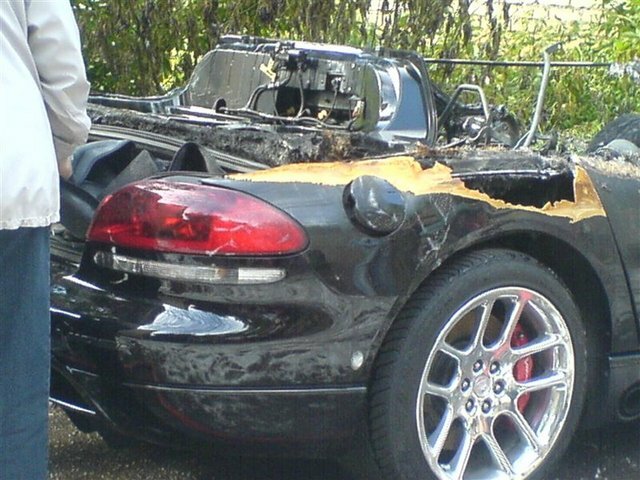 these new vipers are known to catch on fire. saw it on top gear, happens because the exhaust runs under the sideskirts and gets too hot. 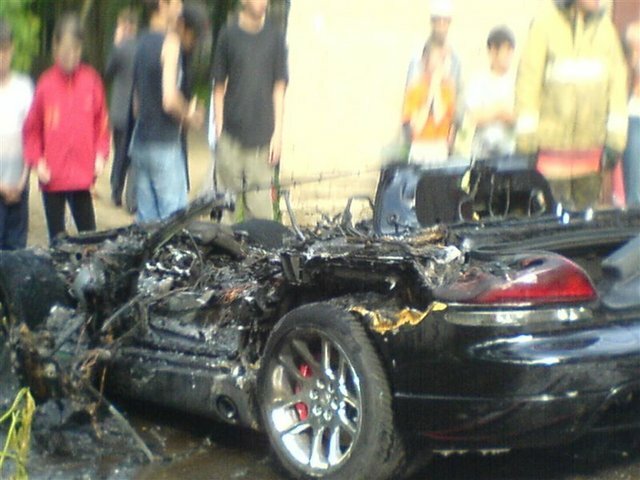 they were test driving one and it caught alight. 666 is the mark you will be asked to take on your forehead or right hand in order to buy or sell in the future. You will be damned eternally so DON’T TAKE THE MARK. It ain’t worth it to sell your soul to the devil for a dodge. I can’t trust that 666 is related with this accident. Thanks for publishing about this. There?s a mass of essential tech info on the web. You?ve obtained a lot of that data here on your internet site. I?m impressed ? I attempt to retain a couple blogs fairly on-going, but it is a struggle occasionally. You have completed a great job with this 1. How do you do it?